So you've decided to buy a car rather than rent for your upcoming visit to the USA. Maybe you have come to this conclusion because you will be here for an extended period of time and it works out cheaper than renting. Maybe it is because you have seen how expensive the one way drop off fee is. Or maybe it is because you are under 25 and with the additional under age charge you are better off buying your own vehicle. ​Whatever your reasons may be, there are a couple of things to consider when buying your new or used vehicle in the United States as a foreigner on a tourist visa. 1. Will you have an address you can have the registration and title sent to? ​After purchasing your new vehicle you will need to visit the DMV to have the car registered and to get the title changed into your name. After you have done this, the DMV will need to mail you the documents (that is the title and registration papers). This means you will need to have the registration and title sent to a physical address. This can take up to several weeks depending on what state you are buying the car in. ​​It is important when planning your road trip to consider whether you will have the time to wait for the registration and title to be mailed out to you. When we bought our vehicle in California it took 3 weeks to receive the paper work. This also means that unless you can stay at a friends house and use their mailing address, you will have to wait at your hotel or other accommodations until you receive the paperwork, which could become costly. If you will be waiting at a hotel, make sure you consider and compare the costs involved with staying at your accommodations the entire time it would take for you to find the right vehicle and to register the vehicle and wait for the paperwork. 2. What State Are You Buying The Car? It is worth considering which state you will be purchasing your vehicle in as this will determine the price of the car, how much sales tax will be paid, and even possibly the condition of the vehicle. ​States like California have higher car prices because of strict emission regulations and higher registration costs while states like Oregon do not have a sales tax at all. If you check out vehicle prices in Nevada or Arizona you will see that you get a much better deal on car purchases. ​It might also be worth remembering to check the car for rust if purchasing from any of the eastern states that receive snow as a vast amount of corrosive salt is used on the roads there. ​Most flights to America come through Los Angeles but if you want less hassle and a cheaper car it might be worth considering another state to purchase your vehicle. 3. Will You Need A Smog Certificate? You should know that some states and cities in the USA have strict emission regulations. For example, in California or the city of Portland in Oregon, all cars need to pass a smog test in order to obtain the smog certificate. ​Make sure when you are shopping around for a vehicle that the car you're intending to buy already has the smog certificate or that it is likely to pass. Otherwise you will not be able to have the car registered! Here is a list of the states that we know of that require smog certification: Arizona, California, Colorado, Conneticut, Delaware, Georgia, Idaho, Illinios, Indiana, Louisiana, Maine, Maryland, Massachusetts, Missouri, Nevada, New Hampshire, New Jersey, New Mexico, New York, North Carolina, Ohio, Oregon, Pennsylvannia, Rhode Island, Tennessee, Texas, Utah, Vermont, Virginia, Washington and Wisconsin. Note that it is not always the entire state that requires smog certification or emissions testing but certain cities in the states mentioned. 4. Have You Taken Into Consideration The Purchase of Insurance? After you have bought your new vehicle you will need to purchase insurance. Again, the cost of insurance depends largely on what state you are in. You are able to purchase insurance for 3, 6 or 12 months in the USA. It is also worth noting that a lot of insurance companies will not provide car insurance to those with a foreign license and those companies that will provide insurance for foreigner's will more than likely charge a higher rate. This is where buying a car in the USA on a tourist visa can get tricky. It is illegal to not have insurance in the USA and you will not be able to register your vehicle until you have proof of car insurance. You vehicle registration will be cancelled when you insurance runs out. Also remember that you need to keep the insurance policy in the car at all times. 5. Will You Have A Vehicle To Go Look For A Vehicle? It is important to consider that the public transport system is not that great in most parts of the USA so you will more than likely need to consider renting a car to shop around for a car. Finding the right car for you could take some time, especially in a big city like Los Angeles. ​In our experience searching for a mini van in Los Angeles, it took us an entire day just to look at two vehicles because the traffic was so horrendous! Please keep this in mind. Therefore you need to consider the cost of your rental vehicle for the entire time it takes you to find one when you are deciding whether to buy a car is the right choice. Some popular car rental companies in the USA are Avis, Enterprise and Budget. 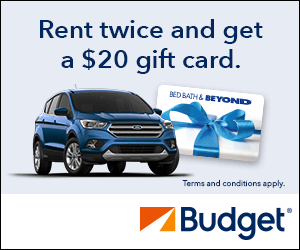 Avis and Budget offer discounts if you book your rental in advance. 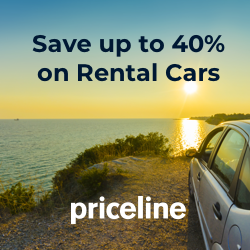 You can also use a search engine like Priceline.com to find the best deals on car rentals. Should You Buy A Car Vs Renting One? In our opinion, buying a car in the USA on a tourist visa is not as tricky as it seems however it does not neccesarily mean it is the best decision to go with when deciding to buy versus rent. - How long will you be visiting? - Whether you plan to go across the country or explore only a few states? - Do you have a friend's house to stay at the beginning of your trip? - Are you on a tight schedule? As mentioned above, it could take a couple of weeks for you to find the right vehicle and then wait for the registration and title paperwork to come through. This may mean a couple of hundred dollars when you add up accommodation and car rental costs depending on where you are staying and who you are renting your vehicle with. Also, the fact that you will need to pay insurance is another cost you need to consider and compare with renting a vehicle. ​If you plan to travel for 3 months or longer, then buying is probably going to be a better option for you, especially if you plan to drive across the country. However, if you are only here for a short time or if you have a strict schedule on where you want to visit and places you want to see, you should also think about the fact that your newly purchased vehicle could break down. This would not only incur additional costs, but will cost you time too. This is where renting would be more favorable as you would not need to deal with such unexpected hassles. ​If you are only going to explore a few states, you can save money by planning a loop road trip to avoid one way car rental costs. Some car rental companies have some really great weekly deals if you book ahead. Also, most car rental companies will give you a better weekly rate the longer you rent the vehicle. For example you can rent a car with Avis from Los Angeles or San Francisco for under $200 a week. That's a five week road trip for $1000! Read our blog post on the search for Buying A Van In The USA - Our experience looking for a vehicle in Los Angeles. 5 Stunning West Coast Road Trips You Must Drive! Hi, we're Arial & Jamie. Thank you for visiting our blog! We love exploring the USA and attempting to see everything each state has to offer! You can follow our travels and stay connected with us on social media.